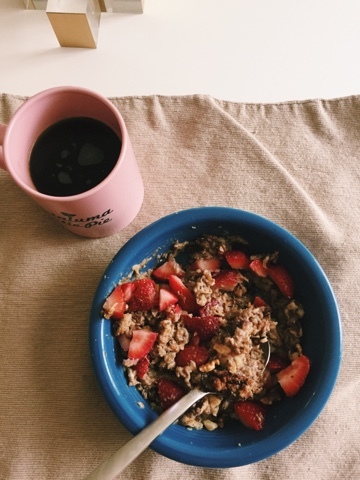 9:00 am Cup of coffee and faux oatmeal with strawberries, almond butter, chia, nutmeg, cinnamon and walnuts. Matt loved it. 6:00pm Forgot to get a picture! Romaine salad with tomatoes and cucumber and a simple vinaigrette. Grass fed hamburger. I'm not going to lie guys, I broke the rules. I went wine tasting today. I currently live in Sonoma county and my lease is up at the end of the summer. My commute is pretty bad right now so there's a good chance I will be moving in the next 70 days or so. Matt injured his foot earlier this year so we've haven't been able to do our usually hiking and running that we love. Because we have such close access to wine country, we've taken up wine tasting as our activity of choice. I've really connected with the saying "Progress, not perfection" this year. I've spent too much of my life being a perfectionist and I'm learning to let things go. 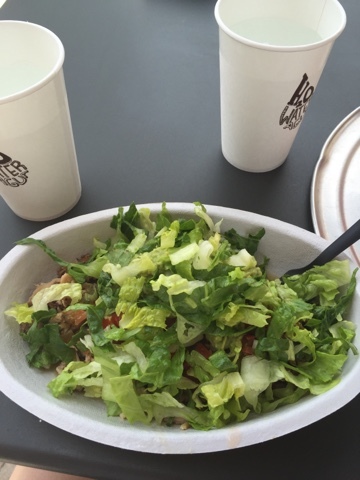 I know that all the material on Whole30 say that one slip up means you need to start over, but I really don't care. This is such a major overhaul on the way I eat and look at food, that I can see myself implementing many of the changes that I've already made. I will not however give up wine. So there.